vSphere 6.5 brings HTML 5 web client, but this one does not cover all features and functions just yet. Again. Why is VMware releasing a vSphere 6.5 without complete HTML5 based web client management, is unknown. A complexity? Perhaps. However, we have information about some significant improvements of the Flex-based client (vSphere Web Client) which, has, for example, a live-refresh. Which is good, but we're still a quite disappointed with this fact that the HTML5 Web Client can be used only partially to manage vSphere 6.5 even if bundled with the GA release. Note that the HTML5 based vSphere client will be a fully supported version in the vSphere 6.5. We have information about some significant improvements of the Adobe Flex-based client (vSphere Web Client) which, has, for example, an auto-refresh feature, but we're still a quite disappointed with this fact that the HTML5 web client can be used only partially to manage vSphere 6.5. Let's cover what's known right now about the different management solutions for vSphere 6.5.
vSphere Web Client – Adobe Flex based. Love or Hate. (Rather hate?). It is currently the main web-based solution. vSphere Client – HTML5 based client, which is a successor of vSphere web client. As for now, it's still proposed as “Fling” with limited functionality. Appliance Management UI – has basic health information, support for backup/restore, possibility to shutdown, reboot. Management via port 5480. HTML5 based. ESXi Host Client – HTML5 based host client. It is mounting star of host-based management. ESXi host client is developed as “Fling” but has been bundled in ESXi 6.0 version. There is no difference for ESXi 6.5 as it is part of the package. PSC UI – Platform service controller a HTML5 web-based UI. Since v 6.0 U1 of vCenter server. It can be used to SSO config changes or manage certificates. Default View is to Hosts and Clusters – yes, this was a major demand of many clients. When you open the web client you go directly to the inventory view. Now you don't have to roll out a VM list – previously you had to roll-up VMs when you had more than 50 VMs. Let's say you had 51 VMs, you had the one item, which you had to roll-up (click) and to expand the VM list. Now you can have 5000 VMs before you'll need to expand the list. But, things go to the right direction…. vSphere 6.5 no longer needs/uses CIP. The Fling has been very good. The development of the tool was very good so far, with many updates, new releases, almost on weekly basis. So it goes really to the good direction…. The new UI has been based on Clarity theme and all VMware products will be in the future using this technology. The VMware HTML5 Fling page here. 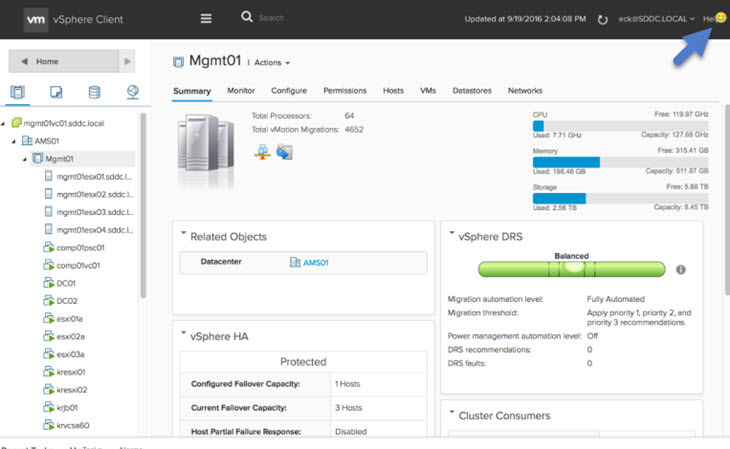 VMware VSAN 6.5 – What's New? Hey Vladan, nice summary, I would love to hear your comments on a comparison between the ESXi Embedded Host client and the vSphere Client (HTML5). Both seem to have a pretty decent amount of support, fast updates, and nice interfaces to work with. Is the choice between them simply just a matter of personal preference or is one of them leading in some way? You will be using the ESXi embedded host client just to manage single host options (without vCenter), IMHO. Otherwise, the HTML 5 web client shall be updated rapidly to match the vSphere Web Client (Flash) which is the only one right now to manage all vSphere 6.5 features. It got faster, again, in this release. But Yes, that’s all we have for now…. Thanks for your comment. Def good, but as said still a lot to improve on. Being a constant fling user I really appreciate the quick fixes/updates. Like the summary. Did the vSphere Web client also gained some performance. I always getting frustrated when it takes time to load stuff.